Piste, originally uploaded by [Zakkaliciousness]. 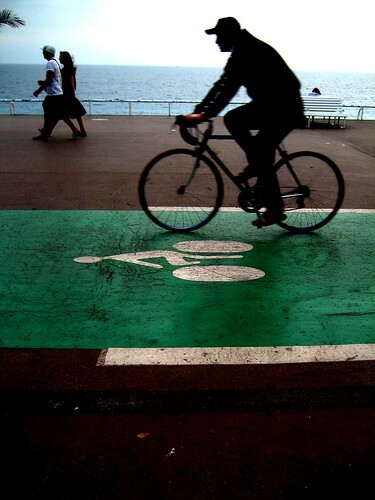 Our good friends down in Nice, Provence, have invested heavily in bike lanes along their famous promenade. In addition they are splashing out on a tram system (like Berlin) and dedicated bus lanes all over the shop. Well done. And a nice green colour, too. I prefer the blue colour of the bike lanes on the streets of Copenhagen, but this green is a lovely contrast to the blue Mediterranean.